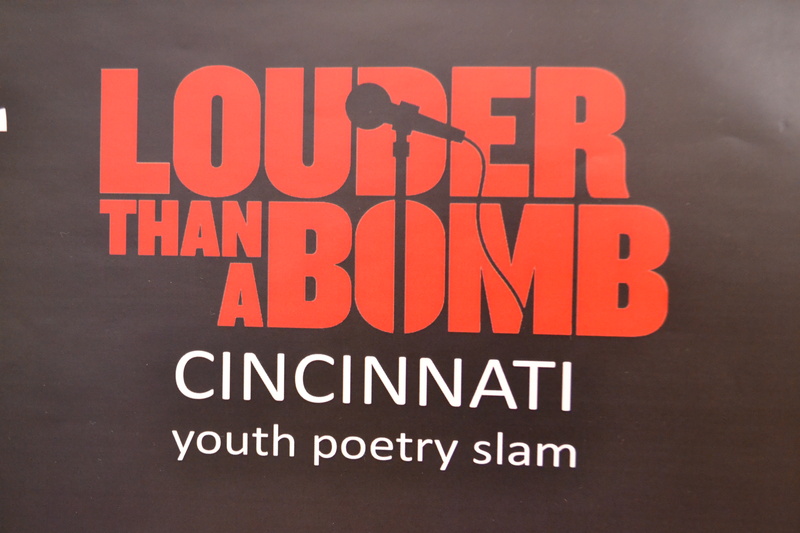 This Saturday, teens from around the city will end a journey that began seven months ago when they meet at the Harriet Tubman Theater for the final bouts of the Cincinnati Louder Than A Bomb poetry slam. 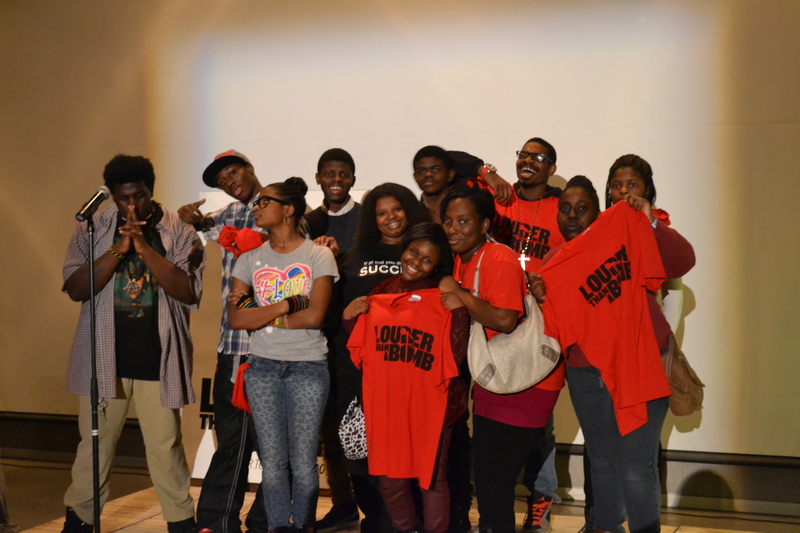 A team of communication students from Northern Kentucky University has been documenting the students from Aiken New Tech High School who make up the WordUp and Aiken teams, and who represent two of the eight teams competing in the LTAB semi-finals. This is a diary of the events from the semi-finals on March 14. 9:13 a.m.- Students, teachers, coaches, parents and children fill the seats in the small, dark DAAP auditorium on University of Cincinnati’s campus. With its modest stage and seating, room 5401 is about to become the battleground where students from across the city and backgrounds will compete for a spot at the finals. The booth where the DJ’s sit glows in the dark. 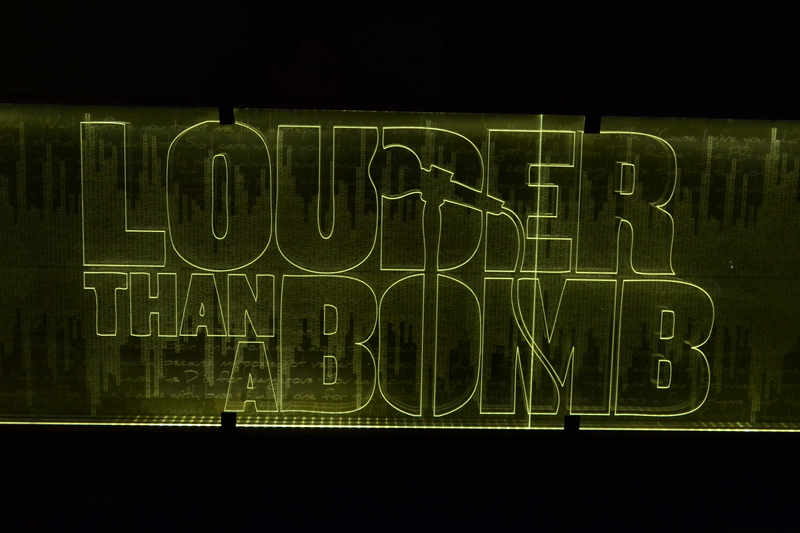 Designed by UC students using LED lights, the four acrylic panels emanate messages throughout the slam to reveal the LTAB logo and song lyrics designed to look like a sound wave which conveys that sound is just as important as words. 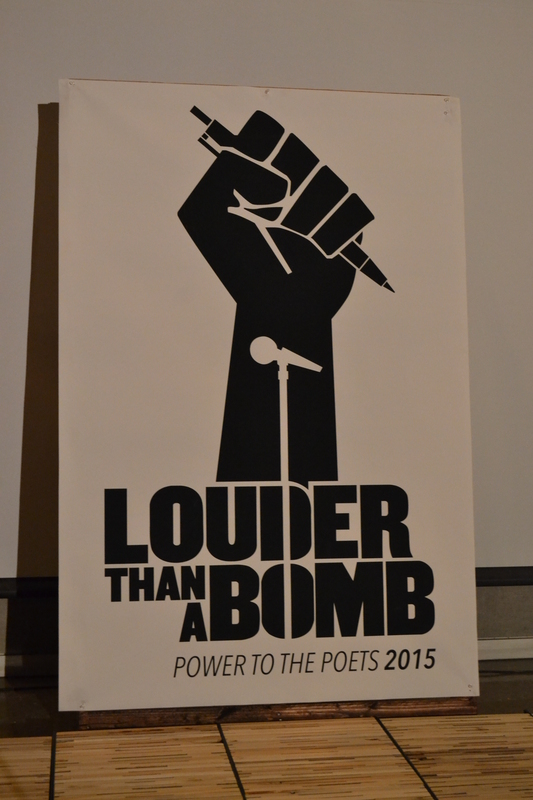 In the center of the stage, a sign with the LTAB logo shows a microphone rising from the words and a fist clenching a pen, conveying the power of the written and spoken word. Aiken New Tech High School senior Lacy “Asylum” Robinson, 17, is the first of the WordUp students to arrive and he keeps to himself at first and finds a quiet seat to review his poem until other students arrive. 9:46 a.m. – The audience is welcomed by McMicken College of Arts & Sciences Dean Ken Petren. 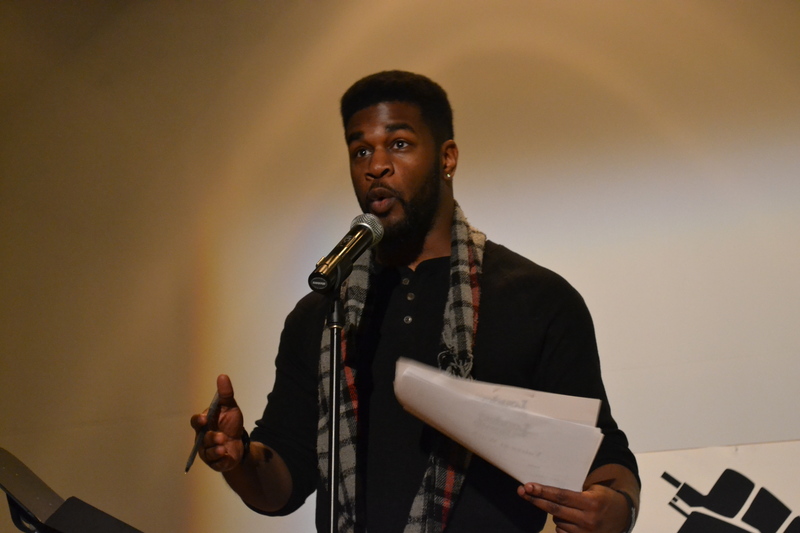 Tony Styxx, a spoken word artist from Indianapolis, serves as the semi-finals emcee. 9:51 am – Emcee Tony Styxx, a spoken word artist from Indianapolis, takes the stage to a modest applause. 9:56 a.m. – Tony Styxx explains to the audience that the slam will consist of two team bouts with each bout containing four rounds. Four teams will compete in each bout and send up one poet for each round. After each bout, the scores from each of the rounds will be added and the top two teams will advance to the final. Styxx also has the time-keeper raise her hand who will be keeping time and signal the poets if they go over three minutes. “Now remember, don’t rush. 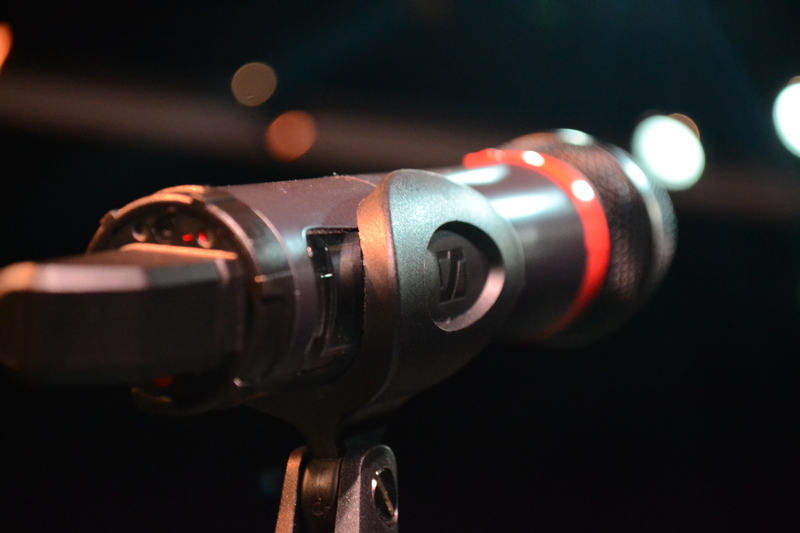 Live, breathe that piece, but keep it within three minutes,” Styxx said. After both bouts, there will be an individual competition where poets will compete head-to-head and the top eight poets will advance to the finals. Audience erupts again into loud applause and yells of excitement as the first round of the first bout begins. 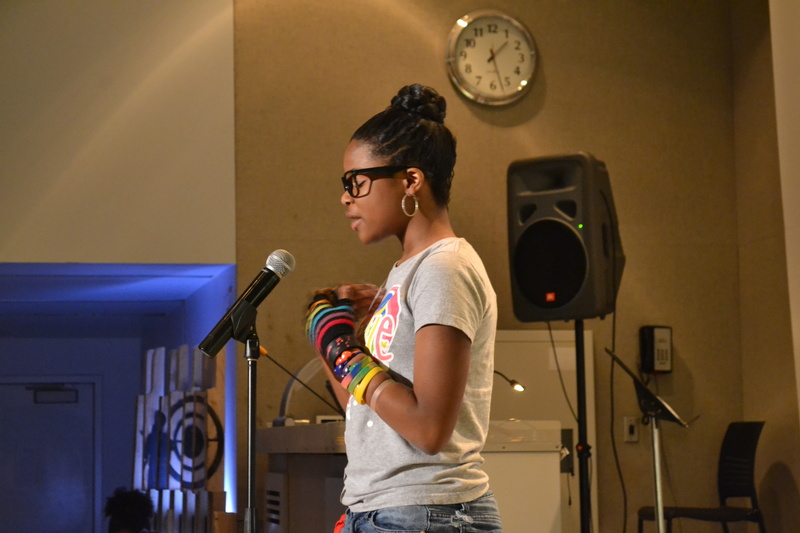 10:04 a.m. – Styxx calls up the first poet from the WordUp team and Tayshona Holliday is the first on stage and free-styled her poem because she forgot the piece she had been working on and got a great response from the audience. “Love is the plant of the most tender kind,” he starts. 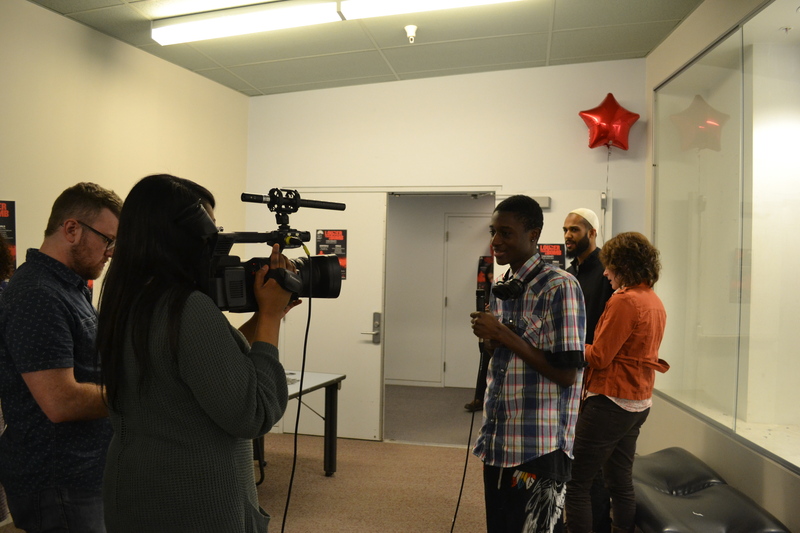 10:34 a.m. – Ending round three is Roman Mayambi representing the WordUp team. 10:43 a.m. – The first poet for the fourth round finished a poem about the racial violence our nation has recently witnessed and the audience was moved. 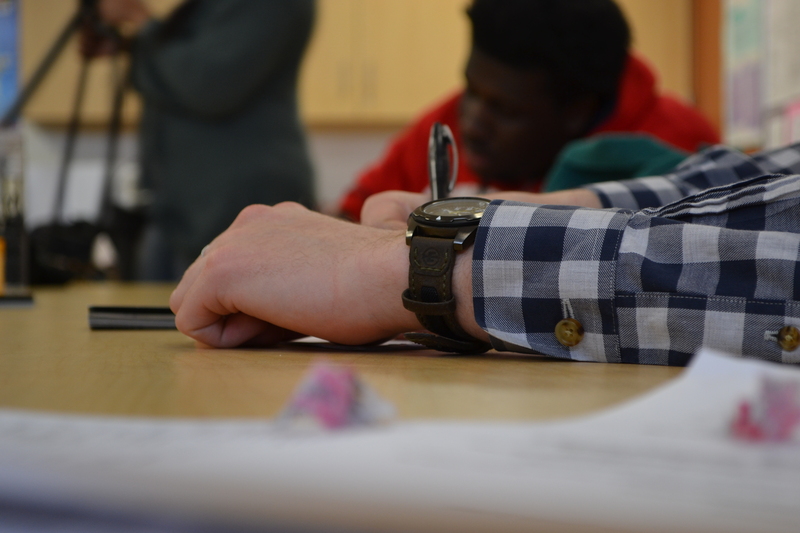 10:48 a.m. – Robinson is the last poet for the WordUp team. 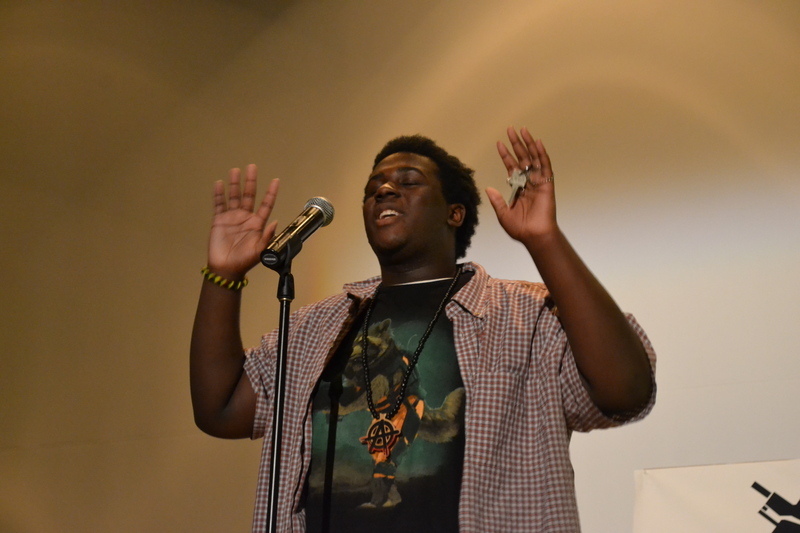 He performed a poem about a girl he loves and the trials of dealing with a mental disorder. Robinson is a natural performer who doesn’t like to think too much about what he’s going to say before he gets up on stage. He writes the basic idea of what he wants to say and then goes up on stage and says whatever comes out. If he’s nervous, it doesn’t show as he begins. Robinson has a powerful presence on stage and a unique perspective and flow that cause people to stop and take notice. The audience explodes into applause when he finishes. 11:24 a.m. – Tony Styxx takes to the stage and announces that the second bout is about to start. 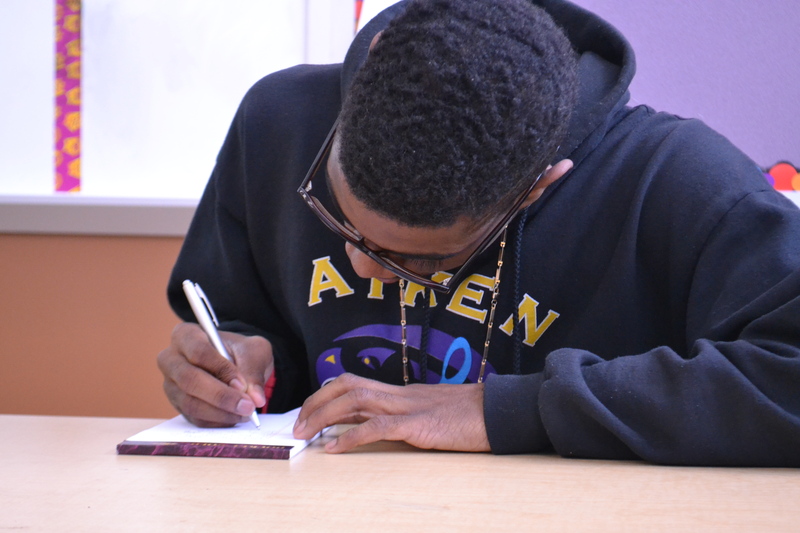 11:33 a.m. – Aiken Senior Casey Roberts is the first poet from the Aiken team to compete in round one of the second bout. 11:44 a.m. – A student from the Seven Hills team performs his piece about a Jew verses and Arab and a misunderstanding they have. 11:58 a.m. – Another student from the Seven Hills team performs her piece on OCD. “What? !” Tony Styxx said from the audience. “You guys are so dope. Inspiring. Remember, if what you do or what you participate in doesn’t inspire you to be ten times greater, then what you’re doing is pretty much a waste of time.” Styxx said. 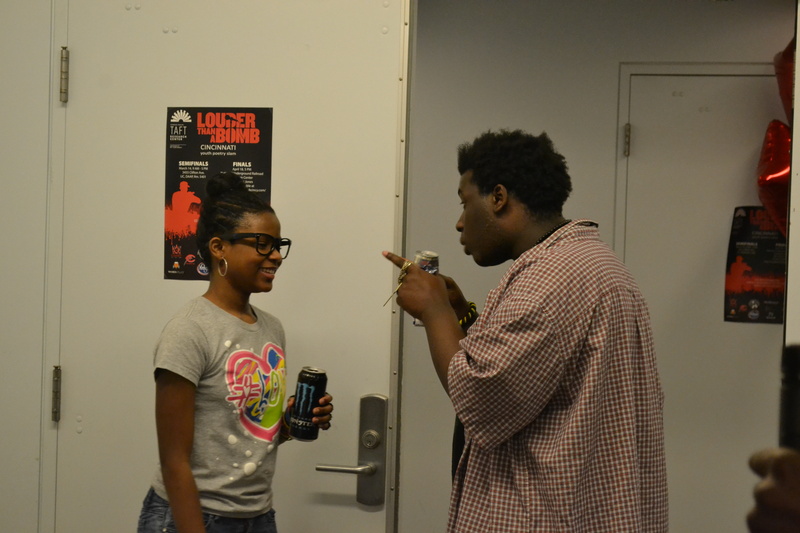 Lacey Robinson gives some words of encouragement to Ronnie Adams who will be performing her poem during the individual bout. 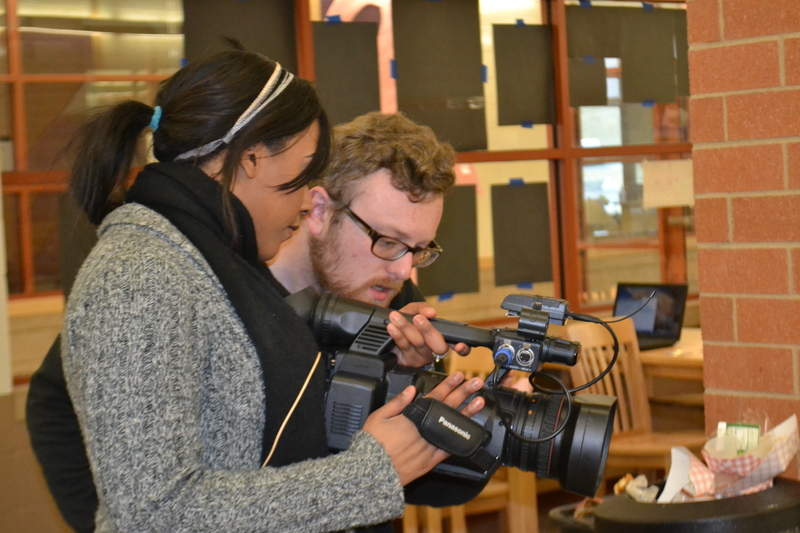 Our documentary crew interviews Jordan Kindell during the lunch break. 12:20 p.m. – Everyone breaks for a pizza lunch. Students from different teams take the time to talk with each other and to talk about their poetry. Robinson will be competing in the individual bout and needs to choose whether to perform the same piece he already performed or to perform a completely new poem for the individual bout so he takes a moment to speak with WordUp tutor Zohair Hussain. 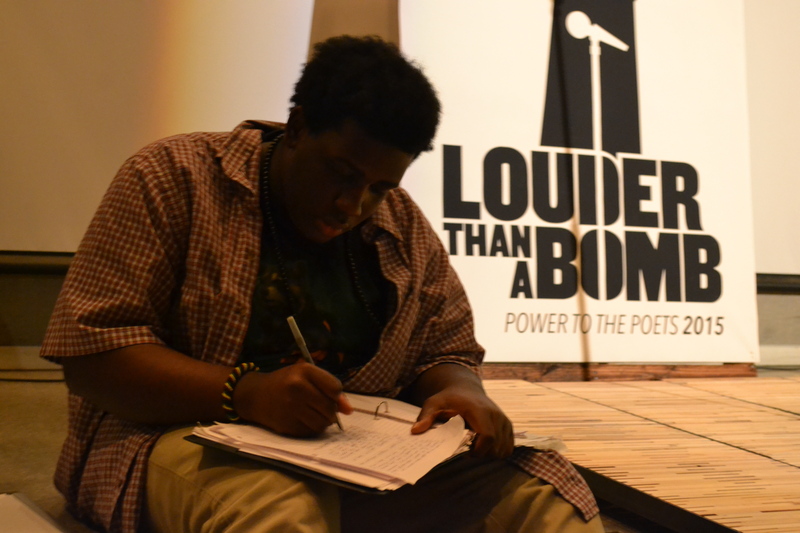 After getting some words of encouragement, Robinson sits near the stage and writes a new poem he will later perform as his individual piece. Lacey Robinson takes a quiet moment during the break to write a new poem for the individual bout. 1:18 p.m. – Tony Styxx announces the winners of the team bouts and Hughes/SCPA, Voices at Work, Walnut Hills and Seven Hills teams will compete in the finals on April 18th. Ronnie Adams performs her poem, “Cinderella,” during the individual bout. 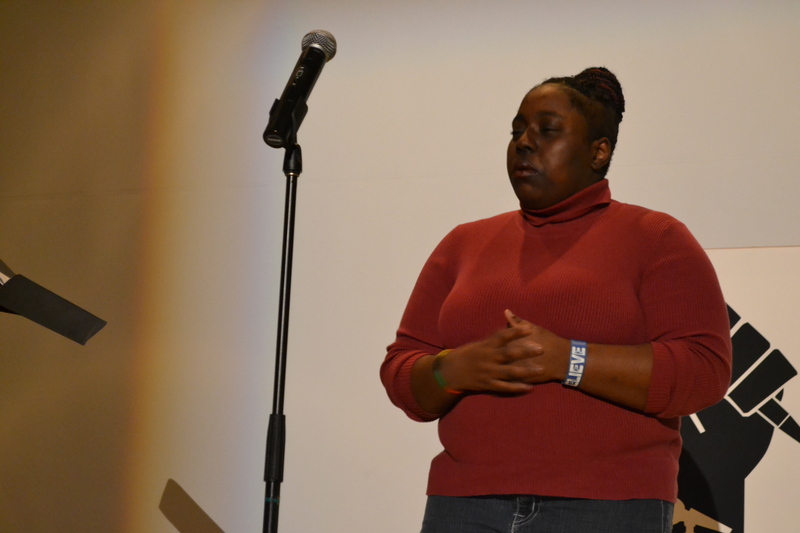 1:21 p.m. – Aiken Sophomore Ronnie Adams, 15, starts off the individual slam from WordUp to perform her piece called, “Cinderella,” which discusses how fairy tales don’t represent how everyone feels about love. Ronnie loses her place and you can tell the nerves are starting to get to her. She covers her face with her rainbow gloves as if she were about to cry. Members of the audience begin to snap to show her support. Shouts of, “You got this!” and other cries of support can be heard from the audience until she continues her piece. After finishing her piece, Adams runs off stage and beings to cry. Her coach and mentor, Elese Daniels and Wordplay co-founder Libby Hunter go out to give her support and after a few moments, she returns to the auditorium. 1:58 p.m. – Lacy “Asylum” Robinson is waiting to perform next and high fives the poet who is on deck after him. 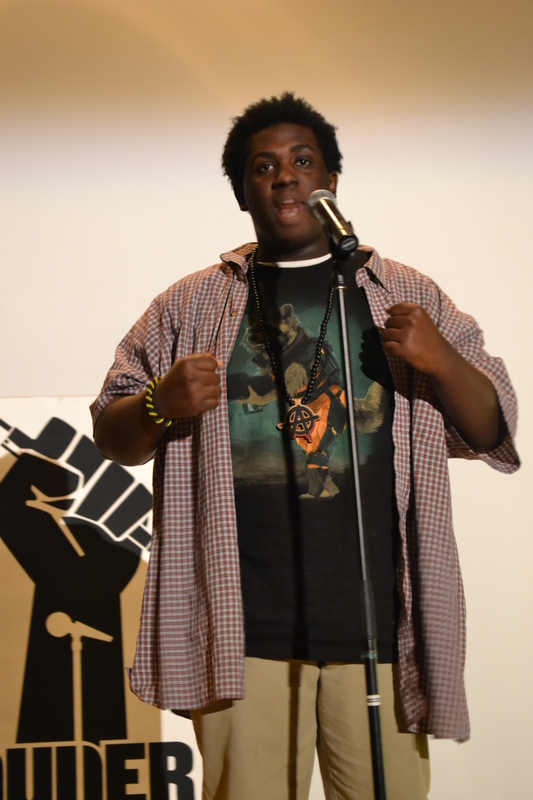 Lacy “Asylum” Robinson performs his new poem for the individual bout and is awarded a spot in the finals. Robinson performs the poem he had just written during the break. 3:00 p.m. – Tony Styxx announces the winners of the individual bout and the top eight scores will compete at the finals on April 18. Lacey “Asylum” Robinson is last name called and wins a spot in the finals. He falls to the ground on his knees and sheds both tears and shouts of both relief and joy before taking his place with the other finalists on stage. It is learned after that Robinson had scored the highest individual score of the night. Tyrese Adams is named an alternate for the individual bout and if one of the finalists can’t participate for any reason, she will compete.